Price discrimination is the act of charging different consumers different prices based on how much they’re willing to pay. There are a few different forms of price discrimination, and it can be achieved different ways depending on how much information a seller has. Haggling, or negotiating to find an exact willingness to pay, is an effective form of price discrimination for large purchases. For example, a car salesman can often start with a high price, and when the customer refuses, he can incrementally lower the price (or otherwise adjust the offer) until he find a deal that the buyer is just barely willing to accept. This has one huge advantage – it gets the most that the customer is willing to give up (or, in other words, it extracts the customer’s maximum willingness to pay). It is, however, very costly for a salesman. Just imagine if the salesman were to spend a whole day negotiating only to realize the buyer wasn’t willing to pay enough to cover the cost of the car. Then, the salesman loses the chance to make a sale at all that day. Since it’s costly, this method is most useful for high-priced items like cars and houses. If you ask a consumer what he’s willing to pay, he’ll lowball you; haggling helps force the price (and the profit) up. Direct segmentation allows a market to be broken up based on some visible characteristic. In the previous post, I discussed my father-in-law’s senior citizen discount on haircuts and how he pays less than I do for the same cut. He does this by asking for a senior citizen discount, which I’m not eligible for. Direct segmentation involves breaking the market up into different groups and intentionally charging different prices to those different kinds of people. It works best when one group has a higher willingness to pay – so, since I’m not a college student, and not a senior citizen, my (relatively) high income means I don’t ask for a discount. Similarly, I pay a lower price to have my blazers dry-cleaned than my department chair does, even though her blazers are made up of a smaller amount of fabric. Dry-cleaners just automatically charge a higher price for a woman’s garment than a man’s, even if the garment is similar. This sometimes leads to unpleasant outcomes. NPR did a story on a 12-year-old girl who had to pay a premium to play Temple Run as a female character; non-white-male characters were all in-app purchases that cost money. Indirect segmentation is like direct segmentation, but requires the consumer to do some work to get the lower price. A good example of this would be a volume discount. I have a strong preference for Crayola An Du Septic dustless chalk. (I like its weight and erasability.) When I purchase chalk to use in the classroom, my buying options include paying about $3.50 for a single box or about $12 for a 12-box package. No sane person who isn’t a teacher has any use for 12 boxes of blackboard chalk, so I signal my price sensitivity by buying a larger amount at once. Another way people reveal their types is by clipping coupons. A coupon is like a little badge that says “I’m cheap! Give me a lower price!” By doing a bit of extra work to signal my cheapness, I qualify myself for a lower price just as much as if I’d haggled with the guy behind the counter. I wear my hair short. Like, really short – it’s buzzed on the sides and scissor-cut on top, so that it’s low-maintenance, and I trim my own beard using a storebought clipper. My father-in-law does the same thing – except he pays a little bit less than I do, because he tells the barber he’s old and cheap. Why does that work? A business, we assume, wants to make money. As such, it wants to sell its good at the highest price possible to each consumer. Consumers, though, want to spend as little as possible, to maximize the difference between their willingness to pay and the actual price they pay. (Economists call that difference consumer surplus.) Most of the time, it’s difficult to charge people different prices based on their willingness to pay. To do so requires three big elements. First, the market has to be segmented. This means that consumers have to have different willingnesses to pay. Think about a price-sensitive consumer like my father-in-law – he’s getting ready to retire. His wife is already retired. He needs to adjust to spending less money than he’s used to. A lot of his fellow senior citizens feel his pain. Meanwhile, I’m a young(ish) guy. I teach at a community college, I have no kids, and I have a long time before I retire (so my money has a lot of time to grow). I’m willing to pay a little bit more for a haircut than he is. In addition to senior citizens, college students are often given discounts just for being students. Second, there needs to be some element of monopoly power. My barber isn’t a monopolist, because pure monopoly is rare, but I do go out of my way to go to a place where I have a good rapport with the barber. I have a guy who cuts my hair the way I like it, and I like the atmosphere at his shop. Plus, even though I could probably shop around to find a cheaper price if I went somewhere else, I couldn’t find a price that much cheaper. Haircuts have pretty standard prices around here. That’s what the monopoly power condition is intended to enforce – if I get angsty about not getting a cheap haircut, I don’t really have other options. Finally, the good needs to be difficult to resell. If we were talking about an oil change on my car, I might send my father-in-law into the mechanic’s shop with my car to get the senior citizen discount on an oil change. When we have a family event planned, he buys the bagels because the local place gives him a deal just for being older. Or if my mother is looking to redo the bathroom, or kitchen – my father has friends at http://www.restorationusa.com/west-palm-beach/ who’ll give them a great discount on that as well. It’s impossible, though, to resell a haircut, so I can’t use his senior citizen discount to my advantage here. Baseball and hockey tickets often offer student rush specials where you have to (theoretically) show a student ID to get the discount. Enforcing that would ensure that people with high willingness to pay didn’t buy the cheap tickets in the nosebleed section, but the open secret is that the Mets don’t really care if you buy cheap tickets, as long as you buy tickets. If those three conditions exist, then it’s possible for a seller to charge different people different prices. Economists call that price discrimination. It’s not necessarily a bad thing, though – it means if you’re cheap, you can get a pretty good deal on some goods. The price-elasticity of demand measures how sensitive consumers are to changes in price. There are two primary formulas for that. Most commonly, introductory courses will use , where means the percentage change. This means the numerator is , where is the original quantity demanded and is the change in quantity demanded. The denominator is . Through the properties of fractions, that ratio is equal to , and a lot of students find that formula much easier to use. Take note of the shape of that formula, and keep in mind the Law of Demand, which states that as price increases, quantity demanded decreases. At high prices, quantities are relatively low, meaning that a small change in price yields a relatively big change in quantity demanded. 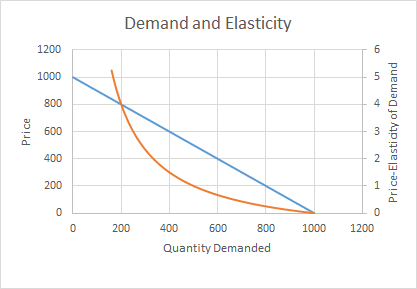 If the percentage change in quantity demanded is bigger than the percentage change in price, then demand is elastic and consumers are price-sensitive. On the other hand, at low prices, quantities are relatively high, meaning that a small change in price yields an even smaller change in quantity demanded. That means demand is inelastic. This pattern of high prices corresponding to elastic demand and low prices corresponding to inelastic demand holds for most goods. At a very high price, firms can make a small change in price to try to encourage new buyers to buy their product, whereas at a very low price, firms can jiggle the price up a little bit to try to snap up some extra revenue without dissuading most of their buyers from purchasing the product. A slightly more accurate formula for price-elasticity of demand is , which looks surprisingly like the previous formula but doesn’t depend on choosing an original value. The graph in this post shows market demand in blue and elasticity in orange. Note the high elasticity at high prices and low elasticity at low prices. When we think about elasticity in the real world, we often think about the properties of things like rubber bands or the waists of sweatpants. If a solid has high elasticity, that means it’s very sensitive to having forces applied to it – so while something like Silly Putty or latex is very elastic, other materials like steel or titanium are not. A small amount of force yields a lot of deformation for Silly Putty, but not much at all for steel. Elasticity in economics works the same way. It measures how responsive one measurement is to a small change in some other measurement. – a small price change yields a big change in quantity demanded. This means that buyers of the good are price sensitive, and (equivalently) demand for the good is elastic. Note that in this case, . – a small price change yields an even smaller change in quantity demanded. This means that buyers of the good are not price sensitive, and demand for the good is inelastic. Here, . – a small price change yields exactly the same change in quantity demanded. The term for this type of demand is unit-elastic. When demand is unit-elastic, . Also interesting is the question of why some goods are demanded elastically and some are demanded inelastically. Typically, goods with many alternatives are demanded elastically. Alternatives can come in many forms. Most commonly, they’ll show up as substitute goods, or goods which you can use instead of another good. For example, bread has many substitutes (naan, grits, cornbread, rice, tortillas, English muffins…. ), and so if the price of bread rose significantly, you’d see many people substituting away from using bread. However, there are other forms of alternatives, too. You may see elastic demand for goods that cost a large proportion of the buyers’ income or that can be purchased over a longer timescale. A college education is an example of both of these – a small change in the level of tuition can lead to big changes in the behavior of students, who will often take a year off to earn money. Anything with few alternatives will typically be demanded inelastically. Salt is the classic example, because it has no alternatives – it’s necessary for flavoring food, allowing our bodies to function properly, and (in the case of iodized salt) preventing certain illnesses. However, anything that is addictive (like tobacco or heroin), necessary for many uses (like cell phone plans), or difficult to switch away from (it’s not like you can put diesel fuel in your gas-engine car!) will typically have inelastic demand. 1 Quantity demanded means the number of goods people are willing to buy at a certain price. 2 Usually one of these will be negative and the other positive, because of the Law of Demand; economists, ever economical with their notation, simply ignore this and use the absolute value. Posted by tomflesher in Micro, Teaching, Uncategorized. When students first hear the word “goods” pertaining to economic goods, they sometimes find it a little funny. When they hear some sorts of goods called “bads,” they usually find it ridiculous. Let’s talk a little about what those words mean and how they pertain to preferences. Goods are called that because, well, they’re good. Typically, a person who doesn’t have a good would, if given the choice, want it. Examples of goods might be cars, TVs, iPads, or colored chalk. Since people want this good if they don’t have it, they’d be willing to pay for it. Consequently, goods have positive prices. That doesn’t mean that everyone wants as much of any good as they could possibly have. When purchasing, people consider the price of a good – that is, how much money they would have to spend to obtain that good. However, that’s not because money has any particular value. It’s because money can be exchanged for goods and services, but you can only spend money once, meaning that buying one good means giving up the chance to buy a different one. Bads are called that because they’re not good. A bad is something you might be willing to pay someone to get rid of for you, like a ton of pollution, a load of trash, a punch in the face, or Taylor Swift. Because you would pay not to have the bad, bads can be modeled as goods with negative prices. Typically, a demand curve slopes downward because of the negative relationship between price and quantity. This is true for goods – as price increases, people face an increasing opportunity cost to consume one more of a good. If goods are being given away for free, people will consume a lot of them, but as the price rises the tradeoff increases as well. Bads, on the other hand, act a bit different. If free disposal of trash is an option, most people will not keep much trash at all in their apartments. However, as the cost of trash disposal (the “negative price”) rises, people will hold on to trash longer and longer to avoid paying the cost. Consider how often you’d take your trash to the curb if you had to pay $50 for every trip! You might also look to substitutes for disposal, like reusing glass bottles or newspaper in different ways, to lower the overall amount of trash you had to pay to dispose of. As the cost to eliminate bads increases, people will suffer through a higher quantity, so as the price of disposal increases, the quantity accepted will also increase. I was excited to see that there’s a new edition of Recursive Macroeconomic Theory by Lars Ljungqvist and the Nobel Prize winning Tom Sargent. I was even more excited to see prices starting to fall into place with respect to the Kindle edition. Textbooks are a special product because demand for them has historically been inelastic: if you need the book, you need it. You won’t have any choice as far as whether to buy it. That’s led price-sensitive consumers to buy used textbooks, but there’s a limited supply. (Of course, even more price-sensitive consumers download the books illegally.) There’s also a pretty big market in old editions, even though there are usually slight differences between editions. Recursive macro is a pretty standard subject, and although the third edition of Ljungqvist and Sargent includes new material, it probably won’t appreciably change the experience for a first-year grad student taking grad macro. There’s some benefit to the new edition, sure, but many students will be faced with the following choice: Pay $82.44 (as of today) for a new third edition, or pay $49.99 for a second edition. That’s a significant savings. However, second-edition sales aren’t beneficial to the publisher, so how can they create an incentive for price-sensitive buyers to give money to the publishers rather than to the secondary market? Well, a Kindle version of the third edition is $51.29. Even price-sensitive students would probably find $1.30 a fair price to pay for an up-to-date edition, assuming they already had a Kindle-equipped device like an iPad. As used copies of the third edition accumulate, the prices of those will probably collect around the $50 mark as well, and if they don’t, I’d expect the price of the Kindle version to float along with that. Make it easy on price-sensitive consumers to give you money instead of giving it to the secondary market, and some of them will. When solving economic problems, the type of firm you’re dealing with can lead you to use different techniques to figure out the firm’s rational choice of action. This week, I’ll set up a thumbnail sketch of how to solve different firms’ types of problems, since a common exam question in intermediate microeconomics is to set up a firm’s production function and ask a series of different questions. The important thing to remember about all types of markets is that every economic agent is optimizing something. All goods are identical. If the seller is selling apples, then all apples are the same – there are no MacIntosh apples, no Red Delicious apples, just apples. There are lots of sellers, so sellers can’t price-fix because there will always be another seller who will undercut. There are lots of buyers, so a buyer boycotting won’t make a difference. The last two conditions sum up together to mean that no one has any market power. That means, essentially, that no action an individual buyer or seller takes can affect the price of the goods. If ANY of these conditions isn’t true, then we’re not dealing with a perfectly competitive market – it might be a monopoly or a monopsony, or it might be possible to price-discriminate, but you’ll have to do a bit more to find an equilibrium. Speaking of that, an equilibrium in microeconomics happens when we find a price where buyers are willing to buy exactly as much as sellers are willing to sell. Mathematically, an equilibrium price is a price such that QS(P) = QD(P), where QS is the quantity supplied, QD is the quantity demanded, and the (P) means that the quantities depend on the price P. Since the quantity is the same, economists sometimes call an equilibrium quantity Q* and the equilibrium price P*. That means if the price is $0, there are 100 people willing to buy one good each; at a price of $1, there are (100 – 2*1) = 98 people willing to buy one good each; and so on, until no one is willing to buy if the price is $50. Demand curves slope downward because as price goes up, demand goes down. Essentially, a demand function allows us to ignore the consumer optimization step. Demand represents the marginal buyer’s willingness to pay; price equalling willingness to pay is something to remember. Firms optimize profit, which is defined as Total revenue, minus total costs. If we have a firm’s costs, we can figure out how much they’d need to charge to break even on each sale. Let’s say that it costs a firm $39 to produce a each good. They won’t produce at all until they’ll at least break even – or, until their marginal benefit is at least equal to their marginal cost, at which point they’ll be indifferent. Then, as the price rises above $39, charging more will lead to more profit. Even if the firm’s marginal cost changes as they produce more unity, the price of the marginal unit will need to be at least as much as the marginal cost for that unit. Otherwise, selling it wouldn’t make sense. The first condition to remember when solving microeconomics problems is that in a perfectly competitive market, a firm will set Price equal to Marginal Cost. If you have price and a marginal cost function, you can find the equilibrium quantity. If you have supply and demand functions, set QS(P) = QD(P) and solve for the price, or simply graph the functions and figure out where they meet. 3. Rational people think at the margin. That’s one of Mankiw’s Ten Principles of Economics. (#3, in fact). What does it mean? The usual definition of “marginal” is “additional.” In other words, the marginal cost of something is the cost of buying another one. So, we can rephrase Number Three as “Rational people think about the next one of whatever it is they’re thinking about.” We can also think about marginal benefits. How much would you pay for a Dove Dark Chocolate bar?1 Whatever your answer, that’s the benefit that a Dove bar affords you. Currently, I have zero Dove bars, so the first Dove bar I bought would give me a benefit. Economists measure benefit in two ways: either in utility, which is an abstract concept of “happiness points,” or in dollars, which are, well, dollars. If I’d pay $1.50 for a Dove bar, then my marginal benefit for a Dove bar is $1.50. Because this sounds simple, economists sometimes make this sound more complicated by calling it money-metric utility. After I eat the first Dove bar, I really wouldn’t want another 0ne – at least, not as much as the first. I’m willing to pay $1.50 for the first one, but $1.50 would be too much for the second. I might buy two if they’re on special for two for $2.50, but I wouldn’t pay much more than that. That means I value the second Dove bar at $1.00, or the benefit I’d get from two bars minus the benefit I’d get from one bar.2 This is pretty normal – marginal benefits, or marginal utility, is decreasing in quantity for most goods. That’s just a fancy way of saying that the second one isn’t as good as the first, and the third isn’t as good as the second. The technical term for that is diminishing marginal returns. Should I buy the second one? If you make the decision all at once, you’d say that I value two bars at $2.50, so why not? Here’s the problem: that gives me a total benefit of $2.50 at a total cost of $2.50, for a consumer surplus of $0. If I buy the first bar, I get a consumer surplus of $0.25. Buying the second bar amounts to paying $1.25 for something I only value at $1, so I’d get a consumer surplus of -$0.25. Thinking at the margin allows me to spend that last $1 on something I actually value that much. The fundamental criterion for making decisions in economics: do something only if its Marginal Benefit is at least as much as its Marginal Cost. In other words, don’t buy something unless you’re at least breaking even. 1 Okay, that’s a 24-pack. How much would you pay for a 24-pack? Probably not more than 24-times-your-valuation. But we’ll chat about that later. 2 Mathematically, marginal benefit is defined as , with Δ meaning “change.” Here, the change in benefit is $1.00 and the change in quantity is 1.